Since its last public beta, it has come underway a significant change — for starters, we have added Greek, Russian and Ukranian localizations, redone the interface for speed, fixed a bunch of bugs and made it so it can bear the tag “4.0″. And yes, we’re proud of what we have done — largely with your feedback. This doesn’t ends the evolution of Installer — actually, this actually begins the road of improvements we have planned, so… stay tuned. Installer 4.0 now supports firmware 2.0, 2.1 and 2.2. If you’ve jailbroken iPhone with QuickPwn or PwnageTool, Installer should be already there. 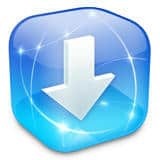 To upgrade to the latest version, just launch Installer and update. The available third-party application in installer is quite good and reliable, i’ve been tried to install one of their great application its called Hood. Its function like SBSettings which is brings toggles and iPhone information on your “Home Screen”. For more details about Hood v1.0 you can check out my post here. Going back to the old days of iPhone without App Store, Installer is a must-have application in every Jailbroken iPhone. It opens a great channel (also the only installer application) to add third-party applications and makes the iPhone even even useful. With the release of iPhone’s App Store, as well as, Cydia, Installer has lost ground to these applications. 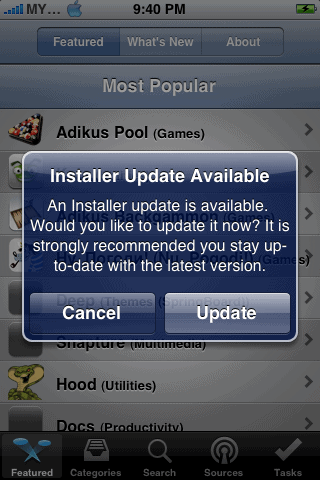 Will Installer make a comeback with its official release?. But for now, if you ask me to choose between Cydia and Installer, I’ll definitely pick Cydia as my default 3-party application installer. Click here if you would like to know how to use Cydia for jailbreak beginner.